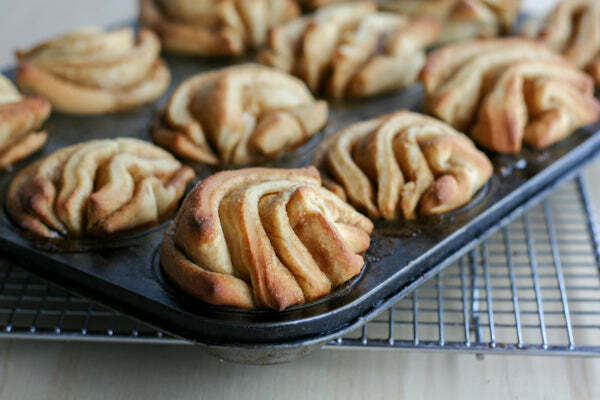 These soft and sinful pull-apart muffins technically aren’t muffins at all. They’re made from sweet yeasted dough which is rolled into strips and layered to create irresistible peelable layers once they’re baked. I’ve made other versions in the past, but this one is for true peanut butter lovers and it’s my favorite recipe yet. 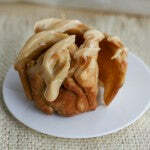 Old Fashioned Smooth Peanut Butter has been worked into every element of the recipe: kneaded into the dough, spread between the layers, and drizzled on top in a cream cheese peanut butter glaze. 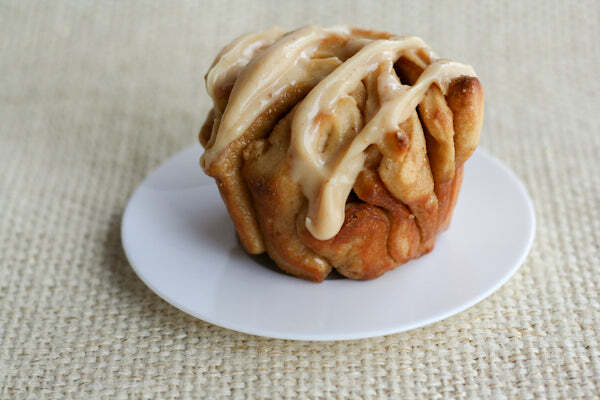 Paired with a mug of hot coffee, it’s peanut butter heaven. 1. 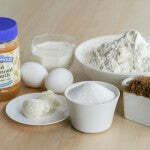 In the bowl of a stand mixer, stir together 1 cup of the flour, ¼ cup granulated sugar, and the instant yeast. Beat in the milk, peanut butter, and water. Scrape down the bowl with a spatula and then beat in the eggs one by one until completely combined. 2. Stir in another 1¼ cups of the flour along with the ½ teaspoon salt. 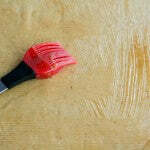 Switch to a dough hook and knead the dough on your machine’s required setting (usually speed 2). 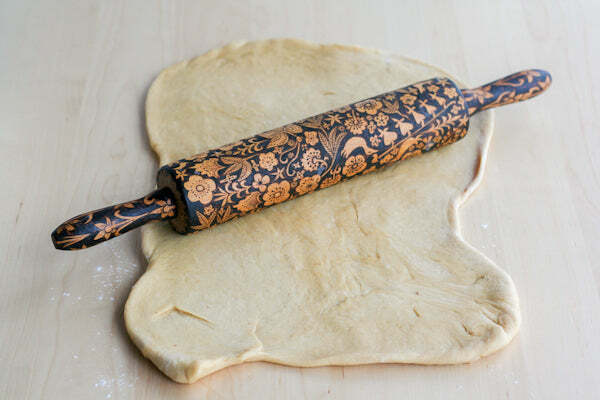 If the dough is sticking to the bottom, sprinkle some of the remaining ¼ cup of flour onto it, allowing it to knead in completely before adding it more. It ‘s likely that you’ll only need a little bit of that last ¼ cup of flour. 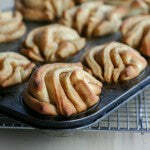 You want the dough to be soft and slightly sticky, and it’s better to err on the side of less flour for a softer dough. 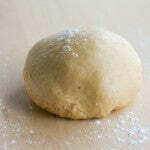 Allow the dough to knead until smooth and stretchy, approximated 8-10 minutes (it helps to set a timer). 3. Cover the bowl with plastic wrap and place in a warm, draft free spot to rise for one hour or until the ball has doubled in size. 4. Once the dough has risen knead it a couple times to release the trapped air. Then roll it out into a 15 x 20-inch rectangle. 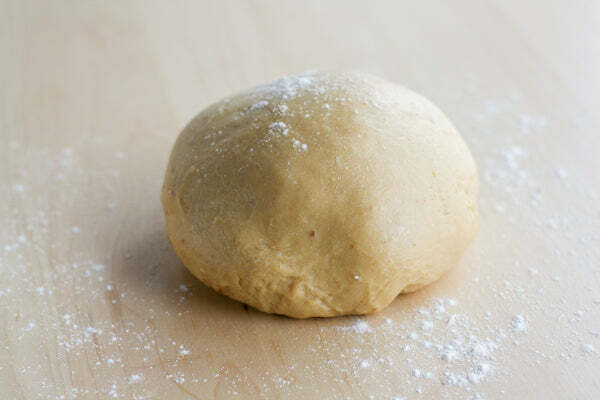 If your dough keeps bouncing back while you roll it, roll it out to half the size then let it rest for five minutes to relax the gluten before rolling it the rest of the way. 5. 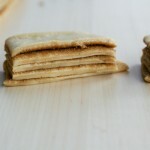 To make the filling: Heat the 3 tablespoons butter with the 1 tablespoon peanut butter in the microwave until melted. 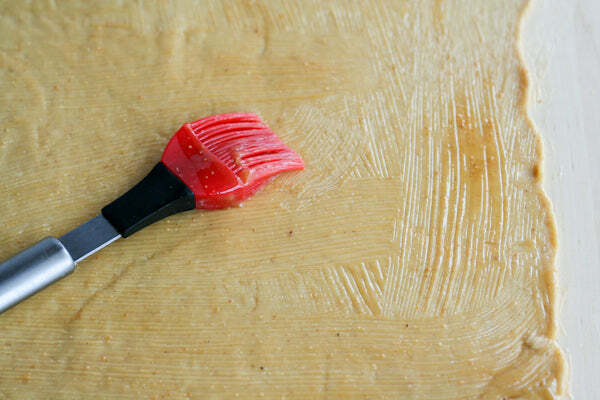 Use a pastry brush to generously coat the rectangle of dough with the mixture. 6. 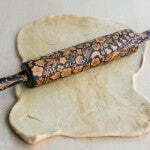 Sprinkle with the 1/4 cup of brown sugar, then use a sharp knife to slice the dough down the middle so that you have two 20 x 7.5-inch rectangles. Cut each rectangle into five 20-inch long strips (ten strips total). 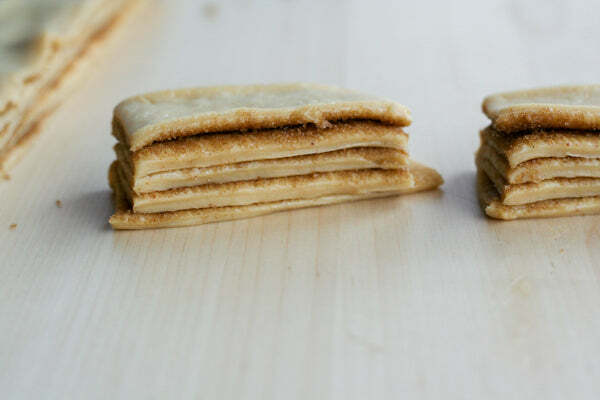 Stack the strips into two piles, flipping the last piece over so that the peanut butter and sugar filling is sandwiched inside. Cut each pile of strips into six equal pieces (12 pieces total). 7. 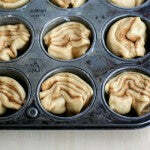 Grease a muffin tin, place the bundles of strips into the muffin tins with their edges up. Press down on them so that they are level or below the top of the pan. It’s ok to squish them a bit. Cover with plastic wrap and allow to rise in a warm place for 25-35 minutes. Preheat the oven to 350°F. 8. Bake the muffins for 10-13 minutes until the tips are brown, and the base is golden when you pull it out of the tin. Be careful not to overbake them. 9. 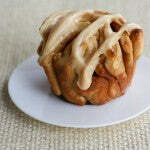 Cool the muffins slightly on a wire rack while you mix up the peanut butter cream cheese glaze. 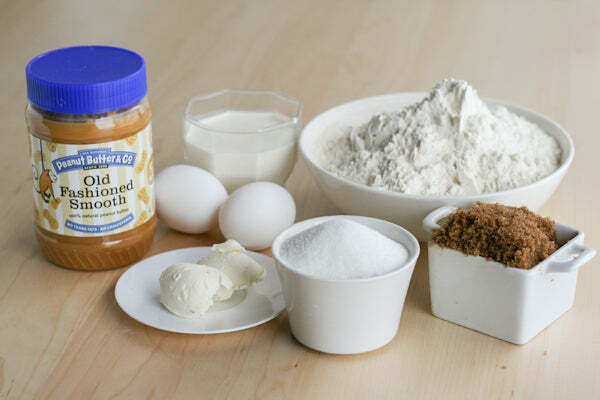 Heat the cream cheese and peanut butter together in a microwave safe bowl until softened. Stir in the powdered sugar and cream. If you want a thinner glaze, stir in more cream until it reaches your desired consistency. Drizzle over the muffins and serve fresh. 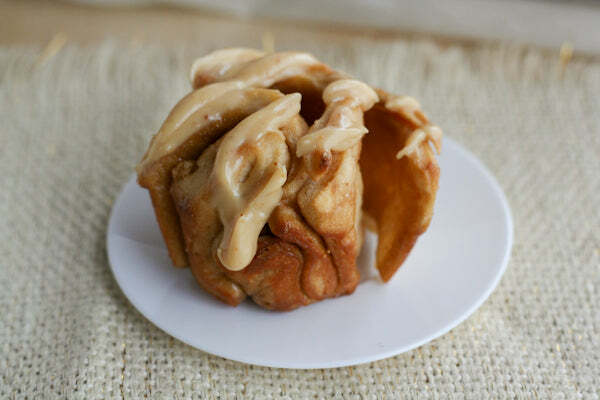 Over what other foods would you love to drizzle the yummy peanut butter glaze from this recipe? – The giveaway is open to USA residents only and will run until Monday, July 21, 2014 at 11:59 PM EST. – Winner(s) will have until 07/24/14 to claim their prize or we will choose another winner. 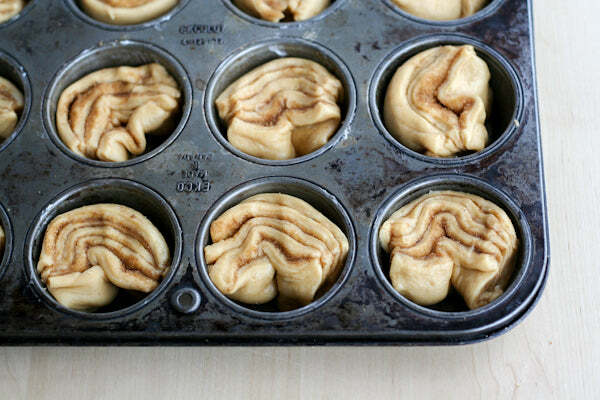 The post Peanut Butter Pull-Apart Muffins appeared first on - Peanut Butter & Co. Recipe Blog.